The temperatures are rising and the sun is making more appearances as the glorious spring season begins in the Pacific Northwest. 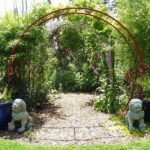 The annual HPSO Open Gardens program started in April and there are even more gardens to see during the month of May. The May gardens are open on weekend days (times and locations are listed for members in the HPSO Open Gardens directory). Approximately twenty of the gardens on this year’s HPSO Open Gardens are those that are featured on the tour for the first time. One of these is the garden of Matthew Hubbard (aka The Lents Farmer). 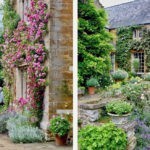 He describes his garden as his personal oasis and it includes a terrific assortment of trees and shrubs, perennial borders, water lily and goldfish ponds, carnivorous plant bogs and a particular plant that he is passionate about – the peony. His collection includes around 85 different herbaceous, tree and ITOH varieties. He has been creating his oasis for the past 11 years and continues to add unique plants and more peonies as more and more grass is eliminated. Peonies are also the feature of one of the nursery display gardens. Adelman Peony Gardens, a family-owned nursery in Salem, has been in business for the past twenty-five years. They have been growing peonies since 1993 and currently grow more than five hundred different varieties. 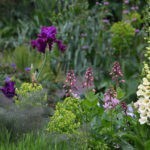 Their display gardens allow visitors to see peonies and other plants growing in beautifully designed borders to help them decide what varieties they would like to take home with them. The nursery has several upcoming events during Mother’s Day and Memorial weekend. Another fantastic nursery display garden is Joy Creek Nursery, nestled on an idyllic hillside in Scappoose, Oregon, about twenty minutes northwest of Portland. Joy Creek Nursery offers a dazzling selection of “unusual perennials” and has extensive listings of clematis, hydrangeas and fuchsias. Their display gardens, which covers four acres, are packed with enticing plants and offers great design inspiration for gardeners. This is just a small sampling of the twenty-plus gardens that are open during the month of May. If you’re not yet a member of HPSO and would like to visit some of these gardens, become a member today to receive your Open Gardens directory with details!